I am unapologetically one of those people who encourage homemade over store-bought. Always. Not in a holier-than-thou Gwyneth Paltrow kind of way, but in a it just tastes better! kind of way. I used to eye roll at this claim before I’d ever shaken up my own salad dressing or blended my own hummus or pesto. But once I did it, I understood. And there was no looking back. Homemade tzatziki is no exception to the whole homemade-is-better claim. The flavor is bigger and brighter; it’s more refreshing and has way more zing. Which makes it perfect for slathering over grilled goodies, pitas, or using it as a dip or salad dressing. How to make homemade tzatziki. Making tzatziki is incredibly easy and quick for the most part—though it’s worth mentioning that it tastes best next-day, after the flavors have mingled and gotten to know one another. So if you can make it ahead of time, great; if not, go for it anyway. It’s still delish. One crucial step is draining your cucumber to rid it of its excess water. (If you’re into it, you could squeeze the minced or shredded cucumber over a clean bowl and save that refreshing cucumber water for smoothies.) (What was that about not being all Gwyneth?). Some recipes call for salting your cucumber and letting it sit in a colander in the sink for 30 minutes so that the salt can draw the water out. I’ve tried this and honestly, I find it quicker, easier, and much more efficient to just grab a handful of minced cucumber and squeeze it over the sink with all my might. Or at least most of it. When I’m done, I just throw the cukes into a bowl along with everything else. You’ll see that I slice my cukes super thin—they’re basically ethereal. You can slice them and mince them in a chunkier fashion if you prefer. Do your thing. Is straining yogurt worth it? Not in my experience, so I wanted to mention it in hopes o save you some time. I’ve stumbled upon many recipes that call for draining the yogurt/squeezing it in cheesecloth to rid of excess water. I’ve tried it and it made zero difference. This may be because the Greek yogurt I buy is super thick, but that extra step of draining yogurt has never made a difference, so I skip it. If your Greek yogurt is less thick, you may want to try it. Let me know if you try it and see a difference! I’m all about taking the proper steps to get the best tasting stuff, but I’m also about skipping unnecessary steps to take it easy. This homemade tzatziki is refreshing and brightly flavored. It goes perfectly with grilled food, pitas, falafel, as a dressing, or as a dip. 1-2 garlic cloves, finely minced garlic will get stronger as the tzatziki sits, so use your own discretion. I love garlic, so I used 2 cloves. Dump the Greek yogurt into a large bowl. By the handful, grab the minced cucumber and give it a good squeeze over the sink or a bowl to rid of the excess water. Place each handful into the bowl with the yogurt once squeezed and drained. Add the garlic, dill, lemon zest, lemon juice, salt, and pepper. Stir to combine. Cover and let it sit in the fridge for at least 30 minutes; best if over night as the flavors will become brighter and stronger. When zesting the lemon, make sure to only zest the yellow rind and avoid the white pith beneath it. The white pith is bitter and will bring bitterness to your tzatziki, which obviously, you don't want. I love this post and totally agree with you...homemade is always best. With simple recipes and directions like yours no one has any excuses! I always just whip mine up before we eat but letting it sit overnight is a better idea for sure. The only way to do that is to use super thick Greek yogurt and get as much water out of the cucumbers as you can! Yes! My go-to yogurt is super duper thick anyway, so I think it just kind of works out. I love tzatziki, and yet I barely ever make it at home despite always having yogurt in the fridge. Seeing as the dip only uses a handful of ingredients, I'm not really sure why I don't make it more often! Maybe it's because I never have dill...I really should try and grow dill this year. For some reason it's also the one herb, I never grow in my garden!! Growing up, dill was my most prized herb. For some reason I never seemed to have it on hand either! Until lately. I grew some last year and never ended up using it. I gave most of it away. SHAME. It's really easy to grow though (it grows like a damn weed) so you should totally get on it! I completely agree with homemade stuff, it just tastes SO much better (on top of being healthier), so why not?! 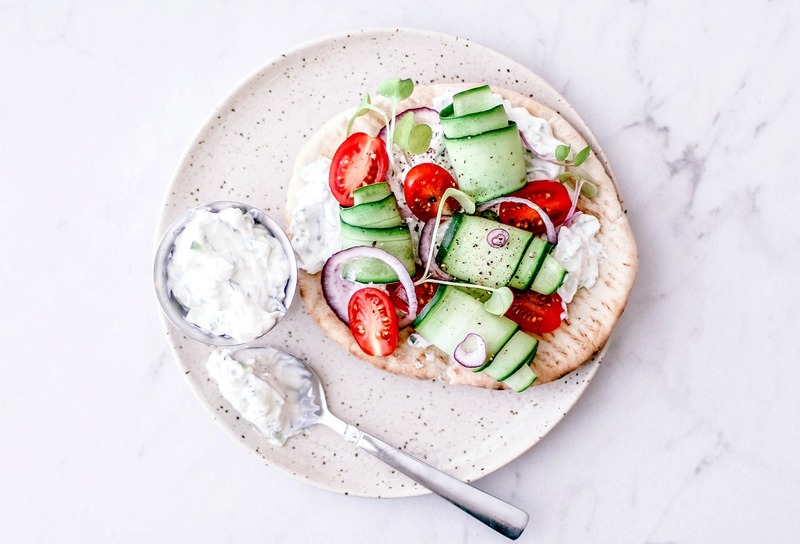 :) I rarely eat tzatziki and I've never made it, but I sure like it when I eat a gyros or something Greek, so will definitely put this on my list to try! Nice job! Thanks, Gabrielle! I officially can't cook Greek or certain Middle Eastern foods anymore *without* first making a batch of this good stuff. I am totally with you... homemade tzatziki is a million times better than the store-bought stuff. I usually throw in 3-4 cloves of garlic, though, because I like my tzatziki to bite back. :) (Also, that way I'm prepared in case we get an outbreak of vampires. Because that could totally legit happen, right?) I've always drained my cucumber in a sieve like a chump, will have to try your trick of just thinly slicing and then squeezing by hand the next time! I totally agree, homemade is definitely best when it comes to sauces, dips and dressings! Looks delicious. I am always so disappointed when I eat premade Tzatziki sauce because I know how much better homemade stuff is! That is a great idea to mince the crap out of the cucumbers and just squeeze instead of salting them! Genius! I agree with you, homemade is always better. I don't think I've ever tried straining the yogurt either except when I want to make yogurt cheese. Oh, and that knife!!! I want that knife! WOW...how deliciously does this look!!! You make it sound so easy. This is the perfect recipe for me. Beautiful presentation. I definitely want to try this, and I'm sure it's very tasty. Thank you for sharing this great recipe! This looks great! We just made Greek Style Flatbread and this sauce would be perfect over it. Gorgeous photos too! I always make my own salad dressings, pesto and hummus, but I’ve never thought to make my own tzatziki. This looks like a recipe I need to try! Would you believe I have never had tzatziki homemade or otherwise? But this looks so good I am inclined to give it a try. I love the idea of serving it over a pita. Sounds healthy and filling! I have this weird thing that I don't eat cucumbers but I actually like tzatziki :-) . Loreto is the one who makes dips and sauces, I'm not good at it ;-) . Your homemade version looks and sounds spectacular. Like all the tips on what worked for you and what didn't. We are with you. Homemade tastes so much better!